Ready for Adventure? 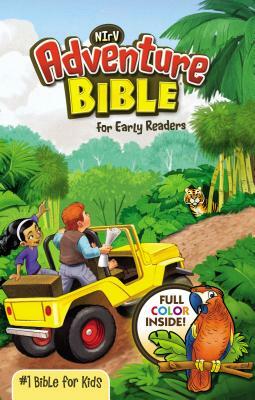 The Adventure Bible for Early Readers takes you on a fun, exciting journey through God's Word. Along the way you'll meet all types of people, see all sorts of places, and learn all kinds of things about the Bible. Most importantly, you'll grow closer in your relationship with God. Here's a quick tour through the features: Life in Bible Times - Articles and illustrations describe what life was like in ancient days People in Bible Times - Articles offer close-up looks at amazing people of the Bible Let's Live It - Hands-on activities help you apply biblical truths to your life Did You Know? - Interesting facts help you understand God's Word Words to Treasure - Great verses to memorize Twenty special pages - Games and other Bible fun, all with a jungle safari theme Book introductions, a dictionary, and color maps Includes the New International Reader's Version (NIrV) that is perfect for children learning to read and explore the Bible for the first time on their own. For games and activities, visit www.AdventureBible.com.